After months of preparing for a trip to Brazil my visa arrived. The first issue that we faced was getting a visa from the U.S. to Brazil. I prepared all the paper work on line and after taking the photos I mailed my passport with the photos and then waited 3+ months for the return of the passport with the visa attached. If you go to a company, pay $450, your visa will be returned much quicker. located in the Iguazu National Park. The hotel location makes is easy to spend the day wandering the many trails to several lookout points with amazing views of the many falls. 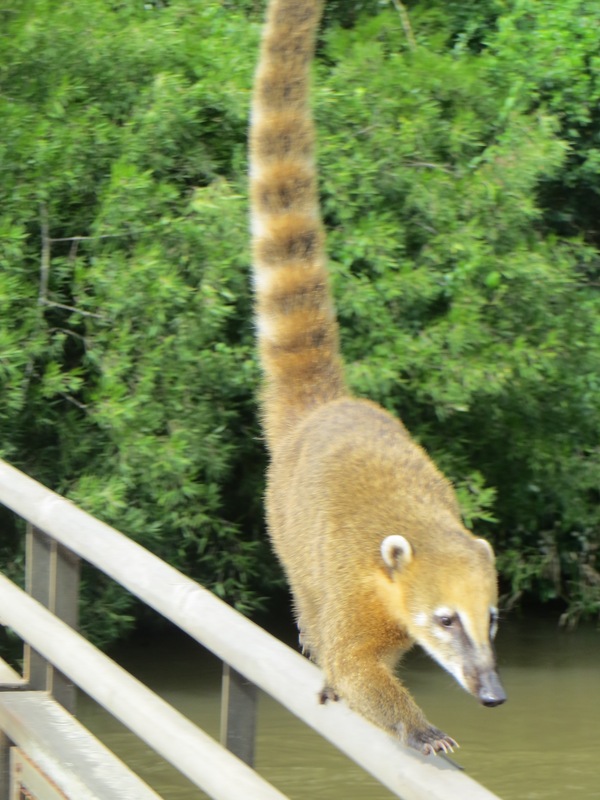 You will also see many lovely butterflies, little creature, caimans, that look like our American racoons running along the railings of the trails and the sounds of the huge falls. In the afternoon we took a raft trip along the river to the base of the falls where we ventured under the spray, a welcome cooling from the 100 degree heat of the day. After the raft tour just remember you will need to hike back up the 100 steps for your transfer back to the hotel. That evening we took a taxi about a 40 minute ride into the town of Iguazu for a fun dinner at “La Rueda” http://www.larueda1975.com.ar. We enjoyed a fun dinner in a rustic building with excellent local fish served several ways. They also served the famous Caipirinha cocktails made with local cachaca, made with sugar cane. The next morning we check out of the hotel and our guide pick us up and we ventured out to explore the falls from the Brazil side. 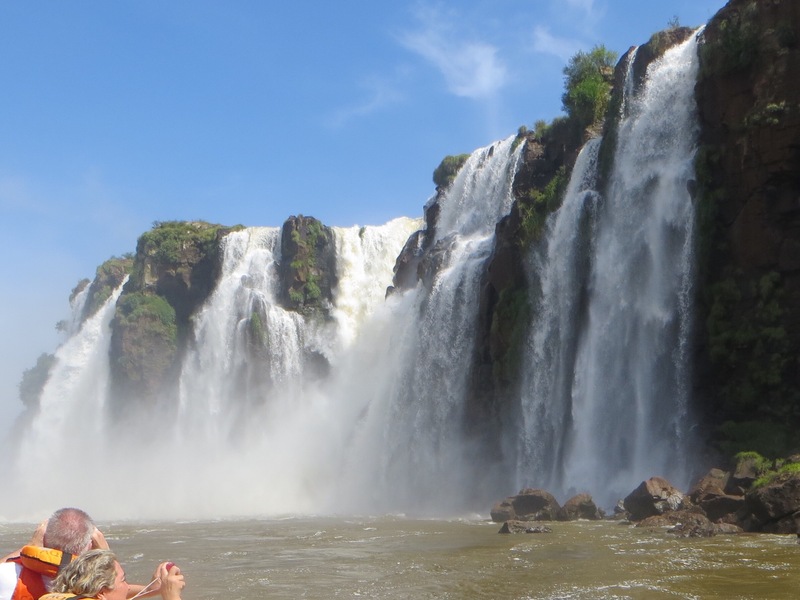 The panoramic view from this side gives you a better idea of the falls grand size compared to the much closer view from Argentinan side. Then we took the short helicopter ride over the falls a quick 15 minutes for $120 worth every penny. Off to the airport and our 2 hour flight back to Rio for our next adventure in Brazil. When we arrived in Rio our cute guide, Rodrigo, pick us up and took us to our luxury Hotel Santa Teresa. The historic Santa Teresa sits high up on a hill with lovely views of the city below. The hotel is about 30 minutes from the beach and town but allow more with the traffic late afternoon, early evenings. The grounds are cool and inviting after a day of touring Rio. We had a great dinner at the hotel at the restaurant Tereze on the lower level of the grounds. The bar is renowned as one of the trendiest in Rio, Bar Dos Descasados serves a mean caipirinha. 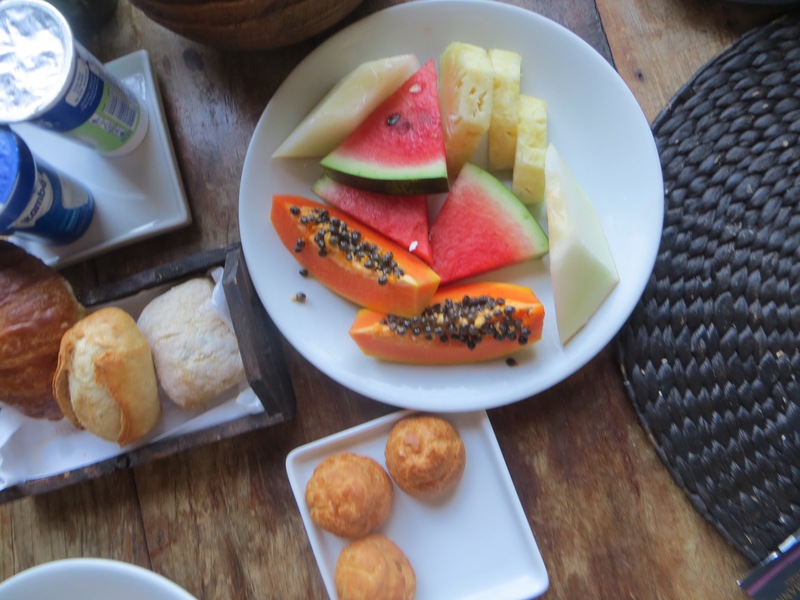 The next morning the breakfast was beautiful way to start or first full day in Rio. We headed to the most famous Attraction in Brazil, Corcovado’s Christ the Redeemer statue. Constructed in 1931 of concrete and soapstone. The top of the platform offers amazing views of the city and beaches on a perfect sunny day. Go early, the crowds make it hard to wander around the whole base and peek into the small chapel on the top. There is a small train that travels back and forth through the heavy vegetation transporting the visitors to the top. Next we headed to Ipnema Beach area for a special local drink prepared beach side made with dried Acari berries, a syrup of Guarana, same ingredient found in Red Bull. Then this is put in a blender with ice and a banana and served for what they say is a pick me up consumed after a work out. For sure it gets your whole body wired. Time for lunch and a little shopping since Brazil is known for shoes the girls could not pass up the opportunity. Nice lunch at “Via Sete” where we experienced our first taste of fresh roasted heart of Palm. They first boil the whole stalk then slice it down the center exposing the soft flesh, then with a few minutes on the grill and a little olive oil it is served as a starter.